Are you looking for private or small group hockey lessons in the Chicago area? If you have a passion for the game of hockey and are serious about becoming an elite player, then you have come to the right place. 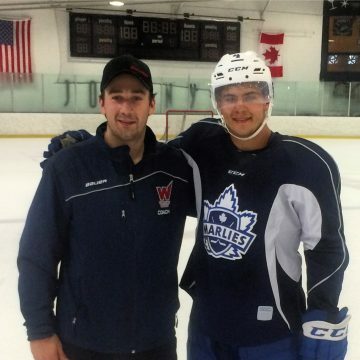 Brian Keane the lead instructor at Prodigy Hockey, will identify the areas of your game that need improvement as well as strengthen the assets you currently have in your game. To play at the junior, college and or pro level you need to be highly skilled but also think the game at an elite level. The Prodigy program teaches skills, tactics and habits that translate into game success at all levels. As a private lesson student, we develop an individualized plan that will allow for immediate growth in your game. 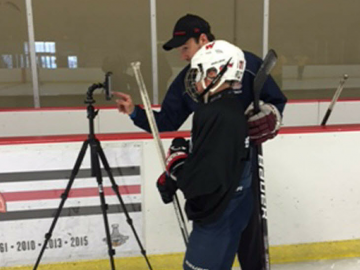 At each on ice lesson we will film your repetitions within a progression for immediate analysis and education on the spot. Seeing yourself on film as you go through a progression accelerates the learning process dramatically. You will also receive a follow-up video breakdown of the lesson for education between our on-ice sessions. This allows Prodigy students to study away from the rink as well to continue their development and see results. The Prodigy hockey program is always evolving through the detailed studying of the top players in the game. You’ll be the beneficiary of the latest skills, tactics, and habits that allow the games top players to have success.